The city that gave Portugal it’s name. Once again I have fallen in love, this time with Porto, Portugal’s 2nd largest city and one of Europe’s oldest, it’s stunning old world buildings, the iron balconies, some in such beautiful colours, I was told you can’t just paint them any colour, it had to represent the port wine houses? I love the unpainted, untiled almost derelict and slightly Gothic buildings, I photographed these at least as much as the well presented ones, I guarantee the photography buffs will have a field day in Porto’s narrow alleyways. San Francisco Cathedral was my fav building of all the buildings we have seen so far, there is something so special so eery, a true gothic building and (spoiler alert) the opulent gilded interior was so unexpected. Some of the buildings are so higlety piglety, there is no one the same, no perfect line of houses, apartments, they appear to be piled on top of each other, some tall some not so, some are tiled to perfection and some are really crumbling away. The atmosphere around Porto jumped out and grabbed you with every step, there are photo opportunities every where, there are so many eateries, so much choice of food, so many tourists with their camera’s, trying to get the perfect jump from the local lads jumping from the bridge for dares or for money, trying to capture the colours of the buildings, trying to get the best view of Porto below from the top of the bridge or any of many stunning view points.. 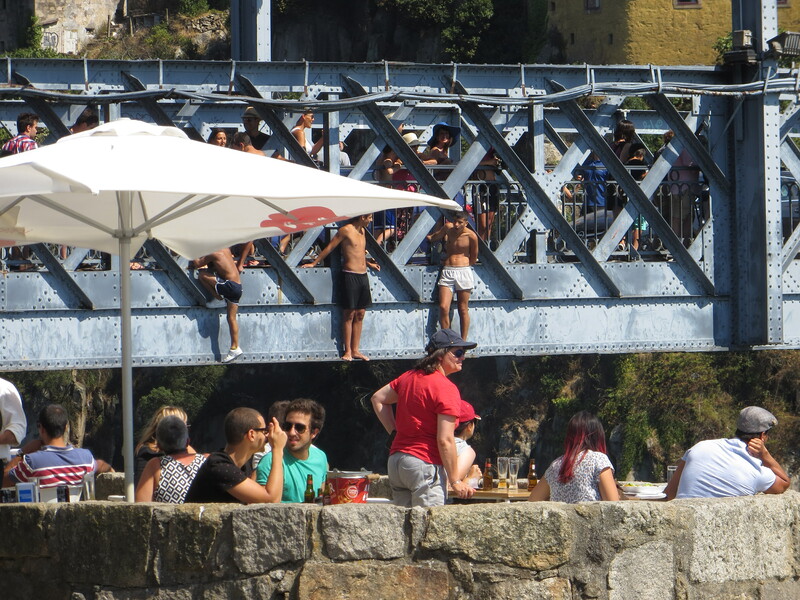 It all wows you, if you haven’t been to Porto, you have to, even if it’s just for a weekend. Porto is a tale of two cities, separated by the Douro river, Gaia is where the original port families stored and aged their wine. With Porto being one of the oldest cities in Europe, it’s picturesque, hectic, it’s beyond beautiful, it’s romantic…you have to see for yourself. Wandering through the colourful Rua das Flores, we stumbled upon this cute little museum. It was well worth stopping, the entrance fee was only 2€ per person. We learnt about the process of making the puppets through videos displayed. The puppets were truly beautiful, the owl the fox, loved them, it really made me want to take the boys to a proper show, I think this would be stunning. We read up on the history of the Majestic Cafe, had to go and have a drink and treat just to say we had. In 1921 in Santa Catarina street this cafe opened and was first called Elite, The café enlightened the street with its Art Nouveau decoration, by architect João Queiroz. The interior is spectacular, the rich leather seating, endless flemish mirrors, varnished wood is joined by the magnificent vision of the plaster-decorated ceiling, combination of marble and metal and it becomes truly exquisite. The gentleman at the door, like a door man at the Ritz, takes you to an available table, it all feels very elaborate and special. A little expensive but you expect that, there wasn’t a moment where a table wasn’t filled. It was worth the experience. Ok so I know I have said that Porto’s buildings are amazing, but Lello Bookshop really is just that. Lello Bookstore opened in 1906, it has a Neo-gothic façade and a breathtaking Art Deco interior with stained glass ceiling, intricate carved wood and one of the most beautiful staircases. I am pretty sure J. K. Rowling got her inspiration for the grand staircase at Hogwarts School from this Bookshop while she was living in Porto, teaching English as a foreign language. Grant thought it would be better as as the book shop in Diagon alley though we didn’t find any spellbooks, in fact if we had one gripe it would be that the books on sale were a little dull, at least in the English section. You pay 3Euros each to get in to the book shop, but, once in, you can buy a book and the cost of getting in comes off the book, so it’s well worth investing in a new book. (we bought one that was priced at 12 Euro’s 50c so we paid for it with our 4 tickets and a 50c coin. So we went to the beach, not for a swim but just to have a look, we were told we could walk though the largest park in Porto and basically end up at the beach at the other end, but we must have turned to the right and came out sideways as once out from the beautiful shaded park we had quite a walk to the beach. In front of us we could see the large piece of modern art that celebrates the local fishing industry, (the locals call it the Jellyfish) after which we arrived at the sandy beach, it really did look nice and sandy, but boy was it busy, probably the busiest we have seen a beach so far, it did look colourful with all the umbrellas up, we got some cool photos. We walked along and saw that we were not too far from Sealife, we had sort of promised Lucas we would take him, because it was a little pricey and Jacob and I were not that keen on going in we wandered around the old fort and let Grant take Lucas in. Not sure if it was a huge hit with Grant, I think once you have been to London Aquarium and even Kelly Tarlton’s SEA LIFE Aquarium in Auckland, it’s actually hard to compare but saying that it was certainly a hit with Lucas, we didn’t do the oceanarium in Lisbon but it’s supposed to be the biggest in Europe so if Aquariums are your thing and you’re going to Lisbon and Porto it’s a safe bet the Lisbon one will be the better choice. You can catch a little local ferry called the `Menino do Douro’ to the fishing village Afurada for 1.50 Euro. The fishing village is only tiny but certainly worth a look, the tiled buildings are a again a mixture of just done up or in disrepair, the local’s all sit outside, it looks like a very sociable set up. We did the world of discoveries museum and the dinosaur exhibition across the road from it together on our second full day in Porto, wanted to get the boys excited about where we were. The World of discoveries I felt was really expensive, we paid 50Euros for the 4 of us, we read a little about the portuguese discoveries and then hopped on a boat that took us around a small world of the history of Portugal, we felt that the models and tour were dated and dull, I would love to have had one of the plentiful staff with lots of knowledge telling us all the information that the audio equipment told us, we could have asked questions, a little interaction would perhaps make the whole experience worth the money. Lucas is obsessed with Dinosaurs so this exhibition was always going to impress him and for that it was worth the money, 20 Euro’s for all of us. It had a few moving dinosaur models, and lots of information, some in English, there was quite a long film/documentary and this totally held Lucas’s attention. Note there was a small ‘5D’cinema that you could pay a few extra Euro’s to do, not worth the trouble, especially if you’ve seen decent 5D movies in legoland or similar. 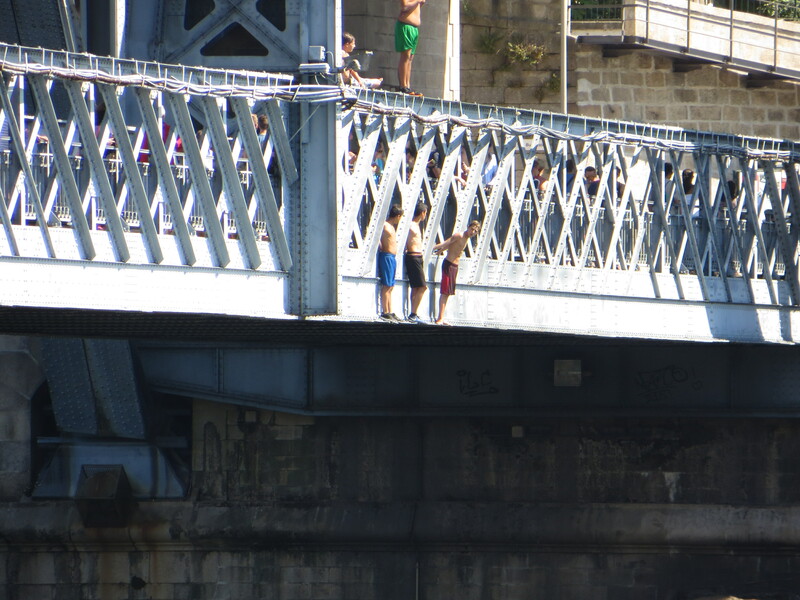 The 3D video was low quality for this day and age and the story (if there was one) was confused and disjointed, the ‘surprise’ spray of water from the, all to obvious, water jets in front of us was the ‘best’ bit, go splash your kids at a fountain and save your money. We saw these bikes around town, first noticed by Lucas, he loved the look of them, later on Grant and I walked past them and realised they were a tour, the price was pretty good so we thought why not, what a fantastic way to see the sights of Porto. We had actually seen a lot of Porto, so mentioned that we would love to go to Gaia and said that we really were happy to just drive and see where Katerina and Sylvia recommended. Jacob loved looking cool in the sidecar and all the attention, cool calm and collective. When we got back Jacob said he would love to do the 6 hour trip so that said something. Lucas loved it, he said he felt famous. Neither of the boys were willing to give up the sidecar at any part of the trip, but the backseats are also a great place to see the town from. We had an awesome trip, had so much information about the sights we were shown, taken to a beautiful view of Porto’s Ribeira. Loved that both Sylvia and Katerina had huge amounts of enthusiasm for the history of Porto, they gave us lots of info of other places we must see, it felt like you had made some local friends and they were showing you the places you wanted to see. The Motorcycle sidecars meant the kids were happy regardless of what sites and information the adults were taking in. All tours should feel like this! We had a little taster of Gaia from the sidecars, we wanted to go back and have a proper wander around also wanted to grab a bottle of the famous Porto port. The Porto residents say the best thing about Gaia is the view of Porto, although a bit of a dig at Gaia they do have a point as the view back is fantastic. Along one cafe on the front they had deck chairs set up, sitting in the sun with a cocktail or two gazing to Porto’s beauty, it sounded perfect, but we carried on…was looking for a special bottle of Port and found what I was looking for. We then headed for the the Gondola, it was either the Teleferico de Gaia (Gondala) or a tuk tuk, Lucas picked the Gondola…and we walked across the top of Dom Luis Bridge, taking about a billion photos. We walked across and back again had something to eat and waited on the rivers edge for sunset. We did the gondola on our last full day, must admit the main reason we did it was the save our legs the walk up to the top of the bridge, I love gondolas, but have not enjoyed our last few gondola trips, if you are going to do it don’t expect to get a better view up there than you would from any other view point in Porto. Still it’s an experience and the boys enjoyed it, always a plus. So would you try it? It’s just bread, chorizo sausage, steak, ham, lots of cheese and sometimes if you are lucky you get an egg on top, I wasn’t so lucky and it’s all swimming around in a kind of tomatoey, spicyish gravy. Well, I was intrigued by this dish, it’s a very famous Portuguese dish and it is advertised everywhere, we even saw it on the Portuguese TV news, Lisbon and Porto both had Francesinha festivals while we were there, so I had to try it. I didn’t hate it but I certainly didn’t love it. The locals rave about the dish and especially the sauce, but our only experience of it seemed to be a bit of an over the top toasted sandwich floating in a pool of sauce that almost tasted like they’d drained it from a tin of kids spaghetti, I’m not a great fan of Chorizo while Grant thought it one of the better bits of this dish, an egg would have lifted it a bit, and although I imagine the chef would have killed me I should have asked to have it without the sauce. It’s important to note that every place does it differently, so maybe we just lucked out, we will have to try again next time I guess. It does inspire you to try putting together your own layered Toasted sandwich, the options are limitless and if you just drape melted cheese slices over it and a better sauce who knows maybe it’ll be the new Francesinha Champion. What can I say, Mario picked us up from the station, was friendly and amazing from word go. Arrived at the apartment, he had the fridge filled with important items and ice creams for the boys. He had a glass of port wine with us to welcome us to Porto. The apartment was lovely, had lots of room for us, kitchen was a good size. Had everything you needed and a good sized garden with table, sunbeds and swing chair. Big Supermarket just down the road. Walk into the main Porto area probably took around 30 ish mins.